*What? Let’s be real here. Did you really think that racism went somewhere? It’s still here, loud and proud. And with this election, all bets are off; its coming down to the wire and folks are frightened. And you know what happens when people get scared. Some want this black man out of office so bad they simply can not…WILL NOT, hide the way they truly feel. Raise your hand if you think anyone rushed to remove the T-shirt-wearing-person from the premises. Sell that fool a bridge! So….here’s PROOF that all that matters to MR/PR supporters, is the “”White race” being in the WH & “politics/a, a “better” plan,being the best qualified etc…..ain’t got SHYT to do with it! Nooooooow!!!! (Said like B. Cosby!, wink!) the Demos should make the Repub party “denounce” that shyt, JUST like the made POTUS do….J. Wright! Aaaaand if/when they “don’t”!??…BOOM!! !, got that azz out thurr, hangin lika KITE!!! And along with what they’ve already said (47% n all!!?) there will BE no more……”contest”. So…..do dat shyt, Obie, let’s GO!!!!!!! Chuuuuuuuch! I was just listening to NPR (National Public Radio) on my commute and the report was about the Super PACs, who have no spending cap, and, as mostly 501(c) organizations, are under no obligation to divulge their contributors’ names, have engaged in an until-now unprecedented coordination of efforts to match dollar-for-dollar the Obama fundraising machine. The fact that the reporter and participants (some of whom I believe were members of said-Super PACs) used the word “unprecedented” was quite telling to me. I try to always give the benefit of the doubt, but that seems pretty pointed that since this is UNPRECEDENTED that either they don’t want a brother in the White House or maybe it just reeks of the greedy power-grab antics of a party that has already done its best to trample on the truth, as well as the rights of women, voters without picture IDs, and those less fortunate with scarce, if any, access to affordable healthcare. Check out Toure’s excellent opinion piece in yesterday’s paper. From day one they made it clear they would throw roadblocks every which way Obama turned to make him appear ineffective and to prolong joblessness etc. whites never left the White House, they’re called: The Help. They may not have made this shirt but I sure don’t see them making all that much effort to disavow them. Just a passing statement. 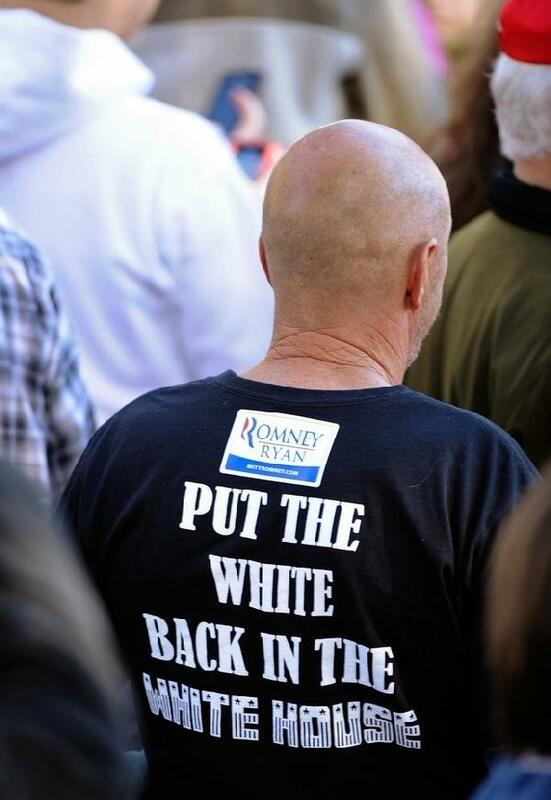 A) its an obvious plant to force forward the “Romney supporters are racist” meme…and if so, mission accomplished! B) It still is an “anti-Palin” shirt, but its worn non-ironically by the world’s dumbest white supremacist. How is this guy a racist? Most blacks only want Obama in the House because he is black. Snoop Dogg has confirmed this. So it’s only racism if a white person does it? And?…..most stupid azz racist?, post BS like YOU posted. So do Us all a favor &….STFU! You don’t “know” ANY”thing about “Us”. Good Day….bigot.